Dr. Romar Rochet graduated from Florida State University in 1999, with a Bachelors of Science degree in Human Science. He has been in solo practice since 2008. At that point, Dr. Rochet switched majors to focus on a chiropractic prep program to finish his Bachelors. He attended Life Chiropractic College, in Marietta Georgia, from 2000 – 2001 and graduated from Texas Chiropractic College in 2004. In 2007, Dr. Rochet returned to South Florida, where he associated with his mentor, Dr. Edwin Cordero, and has been in solo practice ever since. 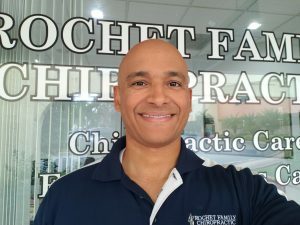 Dr. Rochet began focusing on subluxation – based chiropractic care in 2008, applying adjusting techniques to focus on correcting the structural alignment of the spine. “A well aligned spine produces a strong brain-body connection. A strong connection produces health, from the inside out.” Since 2008, Rochet Family Chiropractic has helped over 10,000 people correct their spinal subluxations, get off medications, avoid surgeries, and improve their overall quality of life. Dr. Rochet is a Christian, a husband to a loving and supportive wife, and a father to 2 well adjusted children. When he is not investing time with his family or adjusting in the office, he golfs occasionally and trains for upcoming marathons. Copyright © 2019 Romar Rochet LLC.. Theme by Puro.